This Guaitil artisan is painting a vase. The workshops where the pottery is made are open air, with the pottery being shaped, being fired in traditional wood burning adobe ovens, and being painted in plain view of tourists who walk from shop to shop. A visit to Guaitil is often combined with a wildlife boat trip of Palo Verde National Park. Tour operators who pick up tourists in Tamarindo to take them on a wildlife boat trip will usually stop for a traditional lunch in a nearby village, and then stop in Guaitil on the drive back to Tamarindo. The popularity of Chorotega pottery has led to a rekindling of cultural awareness and pride in pre-Columbian culture among people in Guaitil and nearby villages. There is surprisingly little pre-Columbian culture in Costa Rica. Tragically, the indigenous population of Costa Rica was nearly eliminated after Spanish settlement of the area. The introduction of diseases from Europe for which the local population did not have immunity was a major cause. But another cause was the enslavement of Costa Ricans to use them to work the mines in Peru and Mexico. Costa Rica was not a rich area (contrary to its name, which means "rich coast"). The Spanish used some of the local population to supply badly needed labor to work the mines elsewhere. The devastation of the indigenous population was so extensive that it has been estimated that despite large immigration, it was not until the 1930's that the population of Costa Rica recovered to reach the same number than lived in the country when Columbus arrived on his fourth voyage. The vast majority of Costa Ricans ethnically are white, of European descent, because the indigenous population was almost totally wiped out. Estimates are that of the present population of 4 million, only 150,000 Costa Ricans are indigenous. The Guanacaste region of northwest Costa Rica, where Tamarindo is located, is the part of the country that has the greatest surviving remnants of indigenous heritage, although it is not prevalent. Guaitil pottery, also called Chorotega pottery, is popular in Costa Rica. It is one of the few artistic traditions that survive from pre-Columbian times in Costa Rica. Chorotega is the name of the pottery, and Guaitil is the village where it is made. Guaitil is a pottery village about a half hour inland from Tamarindo. Around the town square, which like many mall towns in Costa Rica is a football or soccer field, there are a dozen or so workshops of artisans who make and sell the pottery. There are about 100 families who have formed cooperatives to make and sell pottery. Some of them combine their workshop and store with their house. People can walk from shop to shop and admire the goods, but also watch the pottery being made. This artisan is shaping a pot. Most Chorotega pottery is shaped into pots, bowls, plates or animals. Often a short stub of a three-legged tripod is attached to the bottom of plates to make them stand up off the shelf or table. The pottery is painted in earth tones. Chorotega pottery may be purchased in shops in Tamarindo or elsewhere in Costa Rica, although buying directly from the artisans and watching the pottery being made in Guaitil is more fun and interesting. Some guidebooks have said called the Chorotega pottery in Guaitil as the most authentic aspect of pre-Columbian culture that remains in Costa Rica. I will explain the reasons for that tomorrow. Don't worry, I will also show some finished Chorotega pottery as well in the days ahead. Today is Sunday, so my wife and I have posted a new series of photos on our Viva la Voyage travel site. Last Sunday we showed some photos from an old seaside village on the outskirts of Casablanca, so this week we showing some photos of people in modern Casablanca. Here is my son, Stuart, and the pilot, Guido, upon their return from their gyrocopter flight. As you can see from this photo, Stuart thoroughly enjoyed the flight, and I hope you have enjoyed the aerial photos of Tamarindo, Langosta, Hacienda Pinilla, and Playa Grande and the Tamarindo estuary that Stuart took from the flight. He also took video. I became a convert about the gyrocopter during Stuart's flight. As I mentioned when I began this series, I was reluctant for Stuart to fly in the gyrocopter upon seeing it flying up and down the beach, but he was determined to go. After seeing the aircraft, meeting and talking with Guido, and watching it fly, and especially after seeing Stuart's photos, I became a fan of the gyrocopter. I hope to take a gyrocopter flight myself some day. Stuart flew last night to Buenos Aires to visit his older brother. I am sure he will be checking this blog, so I will use this occasion to wish him a wonderful trip, and to thank him for contributing to this Daily Photo site his aerial photos from the gyrocopter. Does this look like what you would expect of houses in Costa Rica? Building houses on a circle drive with common area in the middle is something that would occur only in a master planned community. These houses are large, spaced apart from one another, with well-cared-for landscaping all around. People here have the peace of mind of knowing that everything around them is nice and compatible with their home. On the other hand, they do not have the diversity and vibrancy of living in a town with restaurants, shops, etc. within walking distance to one's home. You need a car here. What do you think? Would you prefer to live or have a vacation home in a master planned commmunity like this, or in a town? There is no right answer, and each of us is entitled to our preferences, so I will share ours. My wife and I chose Tamarindo and Langosta because we like the community and we like to walk to dinner at any of the 50 restaurants in town. We felt that if we were in a master planned community, we would feel like we were limited to the restaurants at the nearby resorts, which over time would be repetitive. We also like being right on the beach. We did not want to have to drive or walk several blocks ot the ocean. 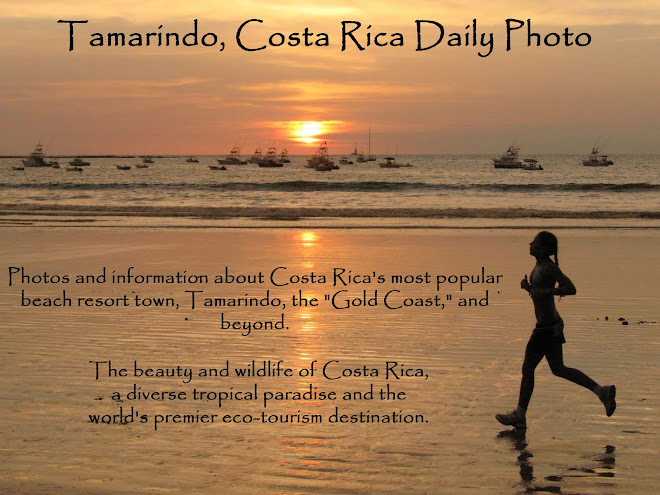 Also, even though Tamarindo is full of international residents, we feel more connected to Costa Rica because Tamarindo is a living, breathing community, whereas a master-planned community isolated from the surrounding area seems somewhat artificial. To us it feels like a bit of Hawaii or Florida transplanted into Costa Rica, and we want to feel a part of Costa Rica.. Some people choose gated master-planned communities because of the security. Both of our condos in Tamarindo have full time security guards and gated entrances. My wife and I have never felt unsafe walking around town, including walking back at night after dinner. Today's photo is another aerial view of Hacienda Pinilla taken by my son during his gyrocopter flight. The side of the gyrocopter is visible in the lower right of the photo. This is a closer view of the new J.W. Marriott Guanacaste Resort. It has a fabulous swimming pool, a nice sandy beach located on a broad stretch of unspoiled and protected ocean front, 310 rooms and the amenities that you would expect of a luxury resort hotel. Yesterday Brattcat left a comment asking a question about how I and local Costa Ricans feel about large resorts such as this. (Brattcat often leaves great comments.) I am an American, so I will not try to speak for Costa Ricans, although I read the English language Costa Rican newspapers which contain articles reflecting local sentiments. Here is my perspective on Tico views and on my own opinion. My perception is that Costa Ricans are very supportive of the development of quality tourism facilities such as the J.W. Marriott. The President of Costa Rica, Nobel Peace Prize winner Oscar Arias, came to the Marriott for its grand opening and spoke glowingly about its benefits. I doubt he would have done that if public opinion were not supportive. Tourism is Costa Rica's number one industry, particularly eco-tourism. The public is aware of the benefits of tourism in bringing jobs and tax revenues for needed infrastructure. Although Costa Rica has been rated as the happiest nation on earth and it is certainly the most democratic and prosperous country in Central America, it is still a developing nation. Tourist communities such as Tamarindo (and I am sure Hacienda Pinilla and the J.W. Marriott will be the same) have been shown to be big sources of revenue to local governments, far exceeding what the local governments spend in the tourist communiities. The public attitude in support of tourism and an international outlook is reflected by the fact that Costa Rica is the only nation on earth to have approved a free trade treaty by a vote of the people! In highly democratic Costa Rica, a nationwide referendum was held on whether to ratify the Central American Free Trade Agreement (CAFTA), znd it passed. Do you think that could happen in your country? There does appear to be resentment among Costa Ricans that many of the construction jobs are filled by workers from Nicaragua, and some estimates are that there are up to 1 million unauthorized Nicaraguans in Costa Rica, with a population of only about 4 million. There is a feeling that there was too much growth, too fast, but density and height controls imposed near the beaches last year does try to ensure responsible, quality development. Here are my own views. I think it is a benefit for tourism in Tamarindo that there is a new J.W. Marriott nearby. It helps reinforce the image of the area as a locale suitable for high end resorts and vacations. The number of tourists coming to Costa Rica, particularly to Guanacaste, has been increasing at a much faster rate than the construction of new hotel rooms. This means that even as hotel rooms are added, there should still be plenty of business for people like me who rent out condos for tourists. By the way, the government has gotten wise to the fact that so many people stay in condos when the come to Costa Rica that it repealed the bed tax levied on hotels guests and replaced it with a tax that the airlines must collect as part of the ticket price when people fly into the country. That way, everyone pays the tax, even if they are staying in a condo rather than a hotel. The J.W. Marriott name and image should make it easier for others, such as condo owners like me, to rent out our condos, even though the hotel is also a competitor for tourist rentals. The Marriott will add to the visibility of our area. For example, I have already secured a rental for one of my condos for next spring because the guests will be attending a conference at the J.W. Marriott, and they have booked my condo to stay in Tamarindo after their conference is over. I should add that I like Marriott hotels. My wife and I own 4 weeks in a Marriott time share and we stay in Marriotts frequently. This shows the setting of the J.W. Marriott Guanacaste Resort. Sitting right on the ocean, with green landscaping and countryside all around. The J.W. Marriott opened last year. The hotel is the top-of-the-line of the hotel brands within the Marriott chains of hotels. It is the first J.W. Marriott hotel in Central America. There are different opinions about the development of large hotels along the northwest Pacific coast of Costa Rica. They provide jobs and tax revenue, but they also require services. They are often owned by foreign corporations. This is a aerial view of some of the condos in the Hacienda Pinilla project just south of Langosta and Tamarindo. As shown in this photo, Hacienda Pinilla has landscaped grounds and architectural controls that are possible in master-planned communities, when a large area is developed under the control of a developer that has designed everything to be coordinated, unlike towns that grew up at different times with different people constructing different buildings sometimes without regard for the architectural style of the other buildings near them. Hacienda Pinilla is able to be developed as a master-planned community because a large tract of land -- 4,500 acres -- stayed in the same ownership and can now be developed in a common plan. As its name implies, Hacienda Pinilla was a cattle ranch until it became developed as a resort area. Unlike the rest of Costa Rica, land ownerhip in the northwest region of Costa Rica, called Guanacaste, includes large ranches that trace their origins back to the days of Spanish Colonial land grants. Guanacaste is drier than the rest of Costa Rica, so that the land is suitable for cattle ranching. Elsewhere in Costa Rica farms are usually small family farms, often growing coffee. The colonial Spanish rulers granted large tracts of land to politically connected families. This is similar to the Spanish Colonial land grants in California, which led to large tracts remaining in common ownership into the 20th century and made possible the Irvine Company holdings that developed much of southern Orange County and the large estate of William Randolph Hearst known as San Simeon. I will show some additional photos of residences at Hacienda Pinilla in a few days, and then post a question about the pros and cons of these developments. The gyrocopter has flown south from Tamarindo and Langosta to the Hacienda Pinilla Golf Course. As shown in today's photo, the golf course has lots of trees and guns alongside the ocean. This photo was taken at extreme low tide, exposing the volcanic rock that at times is under the ocean. Usually the waves wash over the rocks and up to the sandy each. People who rent our condos sometimes ask about golfing opportunities. Hacienda Pinilla is the closest golf course to Tamarindo, about 15 minutes by car. We can walk there along the beach from our condo. Having a championship quality golf course nearby is an important asset to Tamarindo for tourism, as golf is an important activity for some tourists. Yesterday I showed the Hacienda Pinilla portion of Playa Langosta from the air. Today I am posting a photo of the same area from the beach, taken on a different day. This shows a portion of the long length of this unspoiled beach. As I mentioned yesterday, Hacienda Pinilla is a 4,500 acre master-planned, gated area. That is a reason that there are so few people on this part of the beach. Most people cannot get past the gate to go into Hacienda Pinilla. It therefore acts as a boundary for the Langosta area of Tamarindo. All of the beaches in Costa Rica are public, which means that we and others can walk along the portion of Langosta Beach that is part of the Hacienda Pinilla project, but people cannot drive into that area of the beach unless they are let in by the guard at the gate to the Hacienda Pinilla development. I will continue our aerial tour during the next few days by showing some of views of Hacienda Pinilla from above. I predict that it will not look like what you think of when you visualize Costa Rica. Today is Sunday, so my wife and I have posted a new series of photos on our Viva la Voyage travel site. This week, we are sharing some photos from an old seaside village on the outskirts of Casablanca, Morocco. Here are two views of Langosta beach at the Hacienda Pinilla portion of Langosta beach. This scene is just across Langosta estuary from the location of our condo and the Barcelo Resort. As you can see from this photo, the beach is unspoiled, with soft, clean sand extending as far as the eye can see. The top photo looks inland, and the second photo shows the view up the beach from approximately the same spot. We enjoy walking along the beach. Although this spot is only about 300 meters (less than a quarter mile) from our condo, it is much easier to reach this beach by foot than by car. It is a short walk down the beach. To drive to this location, however, you have to drive inland because there is no road across the Langosta estuary, nor should there be. The Langosta estuary, which I showed yesterday and the day before, is left in its natural state to provide habitat for wildlife. To drive to the Hacienda Pinilla portion of Langosta beach, you have to drive through Tamarindo (which takes only 5 minutes), drive inland to the next town (Villareal), then drive south to Hacienda Pinilla and back west to the beach. It takes about 20 minutes to drive to this portion of the beach, which we can reach by walking in about 3 minutes. Hacienda Pinilla is a master planned area of 4,500 acres. It is a gated community. The beach is public and anyone can walk along it, but you cannot drive into the area to reach the beach unless you have a reason to go into Hacienda Pinilla. My thanks, again, to my son, Stuart, for taking this series of aerial photos for my Daily Photo site during his gyrocopter flight. To supplement our aerial tour of Tamarindo, here is a ground level, or should I say beach or water level, view of the mouth of the Langosta Estuary. This is the same location that I showed in yesterday's aerial photo. Yesterday Glenda left a comment that she would like to canoe up the estuary. There are people who paddle kayaks up the estuary. The Barcelo Resort is located at the mouth of the estuary and keep several kayaks on the beach for its guests to use. The estuary is line with mangrove trees. In upcoming posts, I will show more photos of hte Tamarindo estuary to share views of the ecology of a tropical mangrove estuary. Flying south down Langosta beach brought my son to the mouth of the Langosta estuary. To the left of this photo are the Barcelo Resort and the homes and condos of Playa Langusta, which I have shown in the past. To the right is the 4,500 acre master-planned Hacienda Pinilla project, with homes, a golf course, and the new J.W. Marriott Guanacaste Resort. The Langosta estuary separates Langosta from the rest of Tamarindo and Hacienda Pinilla. It makes Langosta sort of like a peninsula, as there is only one road in and out because he estuary snakes behind Langosta to provide a natural area as a buffer between Langosta and the rest of Tamarindo. The Langosta estuary flows out to the sea at low tide, such as the time that this photo was taken, and flows in to the estuary at high tide. These two photos show the boundary between Tamarindo and Langosta. In the top photo, the southern end of Tamarindo beach is in the foreground, with Langosta beach in the background. You can see the effects of the recent growth of Tamarindo, with the seven-story Naxos and Peninsula condos rising above the tree line. Because of the building restrictions I mentioned a few days ago, the remainder of Langosta should retain its low density residential character. The second photo shows the San Francisco point that is to the right of the area shown in the top photo. That point is the dividing line between Tamarindo and Langosta. The point and an off-shore reef and small island protects the southern end of Tamarindo bay from the full force of the ocean's waves. The new Crystal Sands condo building out by the point is visible in the photo. I have been showing aerial photos of Tamarindo taken from the gyrocopter, so I thought I should show a photo of the gyrocopter in flight. The cockpit is open on the sky and to the sides, which offers outstanding visibility and better photo taking than helicopters, as the passenger in the gyrocopter does not have to shoot through glass the way you would normally have to do in a helicopter. The second photo shows the logo of the company that owns and operates the gyrocopter. They call themselves the Flying Crocodile, and they operate the Flying Crocodile Hotel, which is a small hotel in Samara, Costa Rica, which is south of Tamarindo down the Pacific Coast. Samara is much smaller than Tamarindo. The website for the Flying Crocodile Hotel can be accessed by clicking here. Continuing with our aerial tour of Tamarindo, here is an even closer view of Tamarindo beach in front of the Diria Resort complex. You can see some children playing soccer on the beach, and some people who have staked out their spots in the sand. The chairs and umbrellas that the staff at the Diria Hotel sets out for people who stay at the hotel and condos there are also neatly lined up in a row. A life guard stand is also visible. All beaches in Costa Rica are public. People can walk up and down the beach as far as they would like, and there are plenty of places to get access to the beach. This is not like some places in Europe where beachfront hotels have roped off areas of the beach where only their guests can stay and the public cannot enjoy the same beach. The white wall that lines the beach in this area is the dividing line between the public beach and the Diria Resort grounds. There is an entrance to the resort grounds where the little thatched roof gateway is located, and a guard there limits entrance to the resort grounds to those who are staying at the Diria Hotel or condos. Guests can enjoy the shade of the palm trees in the grassy area along the beach. They also do massages under the palm trees along the beach. As is evident from the other photos shown in this series of photos from the gyrocopter ride that my son took, it was, unfortunately, a cloudy day when he did his gyrocopter ride. It was also low tide, and in the morning. A sunny afternoon would produce a scene with more people enjoying the beach, although it would still not be crowded by the standards of beaches in the USA or Europe. This is an aerial view of the Tamarindo Diria Resort the largest hotel in town. It is located in the middle of town and in the middle of Tamarindo beach. This is a closer view of the area shown in yesterday's photo. We have one of our two condos on the fourth floor of the new building in the center of this photo. When we first visited Tamarindo in December 2005, we stayed at the Diria Resort and like it so much we bought the condo at that time, just as construction of the building was beginning. The hotel units are the three low buildings closest to the beach, with the new condo building towering above the hotel buildings to allow a nice view of the ocean. One of the older condo buildings at the Diria is the smaller building at the back left of the photo, which shows the larger scale of the newer developments in town. People who are considering renting our condo often ask how far it is to the beach from the condo. As this photo shows, it is a short walk through lush, landscaped resort grounds to a nice, wide beach. This photo also shows the beach chairs that the hotel staff sets out on the beach. Come on in. The water's fine. My wife and I have started a new website of some of our travel photos, which we plan to post every Sunday. We hope you enjoy checking out today's new photos posted at Viva la Voyage. This is central Tamarindo. It is low tide, exposing part of the wide gently sloping beach. On the left of this photo along the beach is the Diria Resort complex, with palm trees along the beach, some two-story hotel units, and taller condo units. We have one of our two condos in the large condo in the left center of this photo. The white building at the right center is the new Pacific Park condo building. It sits at one of the two main intersections in town. Some people think that its white color stands out too much against the green colors of the trees that, fortunately, are still so prevalent in Tamarindo. One of the provisions of the Presidential order last year that limits the height of new buildings to be built near the ocean also requires that approximately one half of the land area near the ocean must be left in trees or grass,, rather than buildings or parking lots. In he future, that will preserve the green skyline that you see in this photo. This aerial photo gives an excellent overview of Tamarindo. The Tamarindo beach is at the right. In the distance at the top of the photo is Langosta beach, which is a residential area. This photo also shows the growth of Tamarindo with the construction of new and taller hi-rise condominiums in the last 5 years. Those buildings enable people who live or stay in the condos to have a view of the ocean even if they are located a block or so back from the ocean, although the buildings also block the views of the ocean for others and they add density and height to the views of Tamarindo, as you can see in this photo. The President of Costa Rica early last year imposed an executive order that restricts the height and density of buildings near the ocean in the Northwest Pacific region of Costa Rica where Tamarindo is located. The recession in the USA has also slowed the pace of development, as the people who purchase the condo units are primarily people from the USA and Canada, and they are less likely to have the equity in their real estate in the USA to finance their purchases of vacation property in Costa Rica. The Tamarindo estuary snakes from the mouth where it flows into the Pacific back into the low lands north of Tamarindo. This photo was taken looking up the estuary near the spot shown in the aerial photo that I showed the day before yesterday. The Tamarindo estuary is wide near the ocean where this photo was taken and becomes very narrow in its upper reaches. It is lined with mangrove trees for most of its length. It provides good habitat for wildlife. I will show more photos of the Tamarindo estuary in the future. I am showing this photo today to accompany the series of aerial photos that I am showing from the gyrocoptor flight. This is the exact spot shown in yesterday's aerial photo, except this is a ground-level view. The water in the foreground is the mouth of the Tamarindo Estuary just before it flows into the Pacific Ocean. The beach across the way is the southern tip of Playa Grande. The water in which the boat is anchored is the Pacific Ocean. I thought it might be an interesting perspective to show from the ground the same scene that I showed from the air in my photo yesterday. This photo was taken on a somewhat hazy morning, and the blue of the water seems to blend in with the blue of the sky, creating a tranquil atmosphere that I think is quite appropriate for such a serene scene. Here is the first photo from my son's gyrocoptor aerial tour of Tamrindo. This shows the mouth of the Tamarindo Estuary, with the beach of Playa Grande running to the left and the estuary snaking behind it on the right. Playa Grande and the Tamarindo Estuary are part of the Las Baulas National Marine Park. The beach at Playa Grande is the primary nesting site for the endangered Pacific leatherback tortoises. They swim to Tamarindo from the Galapagos Islands to lay their eggs. If you enlarge the photo and look closely, you may be able to detect that there are some homes and small hotels nestled within the trees near Playa Grande. That is the site of a major environmental controversy over the boarders of the park and whether private property near the beach should be purchased by the government to protect the beach (and, of course, at what price should the land be purchased). As I have mentioned before, Costa Rica prides itself on having a larger percentage of its land set aside for national parks and wildlife refuges than any other country -- 25%. The country has many needs for government expenditures, including roads and other infrastructure. Spending tax money to buy expensive beachfront land, primarily from foreigners, is difficult. On the other hand, some international environmental groups have put pressure on the government to proceed with expropriating land, otherwise they have threatened to withhold funds from conservation initiatives underway or planned. Landowners have challenged the government's right to take their land, but my understanding is that earlier this year the court has ruled that the government has the authority to do so. This is a difficult issue and the position of both sides undoubtedly has merit. As you can see from this photo, Playa Grande and Tamarindo Estuary are a beautiful area. With all of the growth and development in recent years in Tamarindo, which you will see in some fo the upcoming aerial photos, I think it is worthwhile to have areas set aside for wildlife and conservation close to Tamarindo. And the pristine area shown in today's photo is indeed close. The town and beach of Tamarindo are right below the spot from which this photo was taken, as the mouth of the estuary is a very popular place for surfers. The gyrocopter carrying my son and Guido, the pilot, takes off. It does not go straight up like a helicopter, but lifts off after motoring down the runway. My initial reluctance for Stuart to take the flight was lessened by my realization that (1) Stuart was goint to take the flight no matter what I thought or said, and (2) I could ask Stuart to take some photos that I could use on this blog. The second photo shows the gyrocopter as it starts to climb and head away for its flight. The Tamarindo Airport is near the entrance to the Tamarindo estuary on the north side of town. The gyrocopter took a 20 minute flight over the estuary, then south along the beach past Tamarindo and Langosta to the new J.W. Marriott Guanacaste Resort at Hacienda Pinilla, then back over Langosta and Taarindo on a more more inland route, before finishing with a loop around Playa Grande. Would you fly in this gyrocopter? My son did. When he visited Tamarindo recently we saw this helicopter version of an ultra-light flying around, and it offers rides to tourists. My younger son, Stuart, kept talking about wanting to take a flight, and naturally, my instincts as a parent were to try to discourage him. I thought the zip lines, rapelling, rock climbing, and other activities at the Hacienda Guachepelin Adventure Tour, which I showed on this site in June, was enough excitement for Stuart's 10 days in Tamarindo. I was wrong. You can see how successful I was in discouraging Stuart. My son is 27 and capable of making his own decisions. He was determined to go. I went with him to the little Tamarindo Airport (which I have shown on this site in the past, as you can see in the index tab for "Roads and Infrastructure"). I went with him in part so I could check out the safety of the gyrocopter. I asked the pilot, "If you are German, how did you get a name like Guido?" He answered, "My mother liked Italians." During the next week or so I will post photos about the gyrocoptor flight. If you click on yesterday's photo and enlarge it, you will see something on the neck of the turtle. Is it a growth from a disease, or baby hatchling turtles riding on their mother's back, or a piece of kelp? To answer the mystery, I am showing another one of the several other photos of the same turtle that I showed yesterday, taken just moments before yesterday's photo was taken. The mysterious object is missing. "I thought it was most likely a piece of kelp and the bulbous piece of kelp, and the bulbous objects are the pneumatocysts (floats) of the kelp. Upon looking closer, I agree it does look uncannily like she's carrying the hatchlings, but I think it is highly unlikely since the mother may not even be in the area when her hatchlings leave the nest. Hawksbills nests 3-5x per season (Witzell 1983) at about two week intervals and eggs incubate for 55-60 days. At most, a mother might be in the area for the first nest to hatch, but I have never heard of mothers carrying hatchlings (despite Finding Nemo's representation of Crush). In addition, though it's possible the brown color on the neck is a weird disease, I know of no reported disease with those symptoms, and therefore I think it's a kelp blade. ">"I totally agree with one of your responders that it does look like an Olive Ridley. I thought the picture was from your solar eclipse cruise, so I was in the hawksbill mindset looking at that pointy beak, and never considered the Ridleys as I've never seen them before. This pic http://animals.nationalgeographic. com/staticfiles/NGS/Shared/StaticFiles/animals/images/800/olive-ridley-sea-turtle.jpg and others clearly show the beak in the photo. As such, my evidence regarding the nesting frequency needs to be modified. According to NOAA Fisheries http://www.nmfs.noaa.gov/pr/species/turtles/oliveridley.htm, olive ridleys nest 1-2x per season either singly or during an arribada. If they also lay nests 2 weeks apart (as I recollect most of the other species seem to do), it is now virtually impossible that a female would be around for her own hatchlings, and I can't imagine how carrying hatchlings from other females around could be evolutionarily adaptive." Here is a sea turtle that we saw during our recent fishing excursion in off the coast of Tamarindo. This is not one of the endangered leatherback turtles, however. During the winter months, it is possible to go on evening beach visits, led by park rangers, in the national park directly adjacent to Tamarindo, to watch the turtles come up on to the beach to lay their eggs, and to watch the hatchlings find their way to the sea. My wife and her brother went out one evening with a park ranger to watch for turtles. The park ranger keeps everyone in the dark, except for a red flashlight, because the lights are harmful to the turtles. They can get confused by lights on the beach, which can interfere with their laying their eggs and the struggle of the hatchlings to find the ocean. One theory is that they find their way by the light of the moon. Minimizing the lights on the beach is one of the reasons that conservation groups favor additional steps to prevent development along Playa Grande, which forms the northern half of the beach in Tamarindo Bay. The area is part of the Las Baulas National Marine Park, but the boundaries of the park are in dispute. On the night that my wife and her brother went out on the beach, they did not see any turtles. Instead, they saw a lot of fire flies. Maybe the light of the fire flies was a deterrent to the turtles. Here is my favorite photo of dolphins from our recent fishing excursion in Tamarindo Bay. I love the combination of the jumping dolphins and the dolphin who has leaped completely out of the water. The dolphins look like they are ready to perform at Sea World. This brings up a subject for possible discussion and comment. How do people feel about places such as Sea World, aquariums and zoos where animals are confined and in some cases trained to perform? My view is that if the animals are well cared for and humanely treated, there is a net benefit in making it possible for large numbers of people see, enjoy, and be educated about the animals and their habitats. The message of environmental protection can be communicated, particularly to children, much more effectively in the “hands-on” experience of encounters with live animals than in books. The excitement of seeing the animals will hopefully spark greater interest and awareness of conservation. The interest in the animal world sparked by visits to wildlife parks will hopefully lead to greater public support for conservation. Nothing compares to the thrill of seeing animals in the wild, in their native habitat. Costa Rica has preserved more than 25% of its land area as national parks and wildlife refuges, which is more than any other country. The area off the coast of Tamarindo is protected as part of the Las Baulas Marine National Park. One of the purposes of that park is to protect the endangered Pacific leatherback turtle. I will have a photo of a turtle encounter coming soon. Here is a close up photos of some dolphins. The dolphins that I showed yesterday and two days ago, on Sunday, not only swam all around our boat, but they came right up to the boat and swam with us. They are playful and seemed to enjoy the contact with the boat. At times they would swim right next to the bow of the boat. Bottlenose and spinner dolphins are common. They can be found from the Caribbean throughout the Pacific all the way to Japan. Individual dolphins are not migratory like whales, however. They tend to stay in the same general area of the ocean. Tomorrow I will show my favorite dolphin photo. I will give you a hint or a teaser. It shows a dolphin who looks like he was auditioning for Sea World. On our recent fishing trip we had dolphins everywhere. I can count about 15 in this photo, and we were surrounded by dolphins in all directions. Of course most of the dolphins were under the surface of the water most of the time, so there must have been several hundred dolphins in this pod. I have several times gone on "Captain Dave’s Dolphin Safari” from Dana Point in Orange County, California. Captain Dave is skilled at finding and photographing dolphins, and he has made some videos that have won awards. The dolphin encounter that my sons and I had off the coast of Tamarindo was more extensive and dramatic than the dolphin safari trips I have taken in California. The purpose of our boating excursion was not to watch dolphins. We were supposed to be fishing. Our fishing excursion was rendered a success, though, because of the dolphin encounter. Tomorrow and the following day I will show my two favorite dolphin photos. Two days ago I showed the corona of the total eclipse of the sun. For even better photos of the corona, I invite you to click on the link to my wife's Scottsdale Daily Photo site, which you can easily reach through a link in the left margin of this site. Today I am showing a photo of the other Corona, taken from the balcony/patio of our condo on the beach in the Playa Langosta section of Tamarindo. This photo is evidence that my sons were visiting Costa Rica at the time I took this photo about 6 weeks ago. I enjoy a glass of wine to accompany sunset. There would be beer in our place only if my sons were present. Before my recent trip to see the total solar eclipse in the South Pacific, if you had asked me what a corona is, I would have said "a brand of Mexican beer." After being entertained by the enrichment lectures on our cruise by leading astronomers Alex Filippenko, Owen Gingerich and Richard Feinberg -- and I do mean "entertained" -- I know about solar coronas and other astrological subjects. If you check out my wife's Scottsdale Daily Photo site this week, you, too, should learn something new about solar eclipses. By comparing my corona photo on August 1 to the two corona photos that my wife showed on her site yesterday and today, you will be able to see the difference that superior equipment and lenses make in taking photos of extremely challenging subjects. I shoot with a Lumix, which has a Leica lens with 12x zoom, which is equivalent to a 36 - 420 mm telephoto. Julie recently purchased a Nikon D90 with 3 Nikon lenses, including a 70 - 300 mm zoom. Her photos are now clearly better than mine, although she now has lots of gear to carry around, (and for me to help her carry). I used to think of myself as the premier photographer in our household, but as Julie's recent photos of the eclipse show, she has eclipsed me, which is fine with me because I do not think I have not gotten worse. The day after the solar eclipse, we had a session on the ship in which they showed some of the best photos of the solar eclipse submitted by some of the 300 people on our trip. I am proud that several of Julie's photos were selected to be shown, even though some of the people on the trip were noted astro-photographers, with their own observatories at home, and some were solar eclipse chasers who had seen more than 10 total eclipses. My wife and I have started a new travel photo blog, called Viva la Voyage. A link to it is in the left margin of this site. We posted our first post last evening, showing a few photos from Petra, Jordan. I hope you find it of interest. A few days ago I showed a photo of a person fishing in the surf. Here is a photo I took from a fishing boat off shore from Tamarindo. As you can see, we found ourselves in the midst of a huge pod of dolphins. Some of them swam playfully alongside the boat, just off the bow, skimming the surface of the water. Everywhere we looked there were dolphins jumping around. Dolphins are among my favorite animals, and I presume yours, too. They are smart, they seem to enjoy contact with humans, and they always have a smile on their face. I have found it difficult to take good photos of dolphins. On auto-focus, by the time the camera focuses on the jumping dolphin, he is back in the water. On manual focus, the photo might be blurry because I do not know the precise distance of the dolphin before he jumps. And of course the dolphin is moving fast, and I am taking the photo from a boat that is also moving, bouncing, and rocking. This is a photo of the total eclipse of the sun that occurred 10 days ago. Today's Monthly City Daily Photo Theme is "night." OK, I know the eclipse of the sun did not occur at night, but a total solar eclipse turns the day into night, so I trust you will agree that it was acceptable for me to take a little liberty and use this photo for today's City Daily Photo Day of "night." My wife and I just returned yesterday from a trip to the South Pacific to view the July 21 total solar eclipse. She will run a series of photos of the eclipse on her Scottsdale (Arizona) Daily Photo site during this coming week. A link to her website is at the left margin of this site. She will include information about the eclipse and about the technique of photographing the eclipse. Julie's solar eclipse photos are much better than mine, so I will return to showing Costa Rica photos tomorrow. Julie has a better camera, better lenses, a better tripod, and she has eclipsed me in her enthusiasm and efforts in taking photos. The opportunity to view a total solar eclipse was a thrill of a lifetime. We were on a small cruise ship that was chartered by TravelQuest International and Wilderness Travel for people who wanted to see the eclipse. We had the benefit of a series of lectures by leading astronomers, such as Alex Filippenko, Owen Gingerich and Richard Feinberg. Photographing the eclipse from a moving ship added to the challenge, but it also proved to be very beneficial because the ship maneuvered to avoid the clouds. Until the eclipse became total, it was necessary to view and photograph the eclipse through dark solar film. Only when the eclipse became total, as it was during my photo shown above, was it safe to look at the sun with the naked eye and possible to photograph the sun without a dark filter covering the lens. I made special solar filters by cutting and taping solar film, which looked like a piece of aluminum foil, on little round cardboard disks that I cut out, and then taping the filters with their cardboard borders to round cardboard tubes that I cut to cover the lenses on our cameras. I encourage you to follow Julie's photos during the coming week. You will see amazing sights, without the time and expense of traveling to a remote area west of French Polynesia and north of the Cook Islands.